Common Prayer helps today's diverse church pray together across traditions and denominations. With an ear to the particulars of how various liturgical traditions pray, and using an advisory team of liturgy experts, the authors have created a tapestry of prayer that celebrates the best of each tradition.The book also includes a unique songbook composed of music and classic lyrics to over fifty songs from various traditions, including African spirituals, traditional hymns, Mennonite gathering songs, and Taize chants. Tools for prayer are scattered throughout to aid those who are unfamiliar with liturgy and to deepen the prayer life of those who are familiar with liturgical prayer. Ultimately, Common Prayer makes liturgy dance, taking the best of the old and bringing new life to it with a fresh fingerprint for the contemporary renewal of the church. Churches and individuals who desire a deeper prayer life and those familiar with Shane Claiborne and New Monasticism will enjoy the tools offered in this book as a fresh take on liturgy. About "Common Prayer Pocket Edition"
Common Prayer Pocket Edition helps individuals and today's diverse church pray together across traditions and denominations. With an ear to the particulars of various liturgical prayer traditions, and using an advisory team of liturgy experts, the authors have created a tapestry of prayer that celebrates the best of each tradition. This convenient and portable book also includes tools for prayer scattered throughout to aid those unfamiliar with liturgy and deepen the prayer life of those already familiar with liturgical prayer. 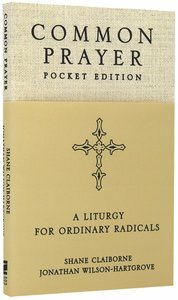 Common Prayer Pocket Edition adds new prayers for compline (late evening) and for individual use, such as prayers for travel, protection, and various blessings. It includes a table of days and readings for the morning prayers as well as an annotated list of saints and days to remember. Churches and individuals who desire a deeper prayer life--and those familiar with Shane Claiborne and New Monasticism--will enjoy the tools offered in this book as a fresh take on liturgy.